Good, honest fun — First and foremost, Ultratron is good fun. It’s not the most interesting or challenging twin-stick shooter, but it is an enjoyable enough romp for both single and co-operative play across just over 40 levels and challenge stages. The game can easily be finished in about half an hour, but it offers plenty of replayability and doesn’t outstay its welcome. Retro stylin’ — The claim that Ultratron has a “retro-futuristic” style is certainly an accurate one. The graphics and soundtrack both remind me of something taken straight from the eighties, although both feature the kind of polish that we’ve come to expect from modern videogames. 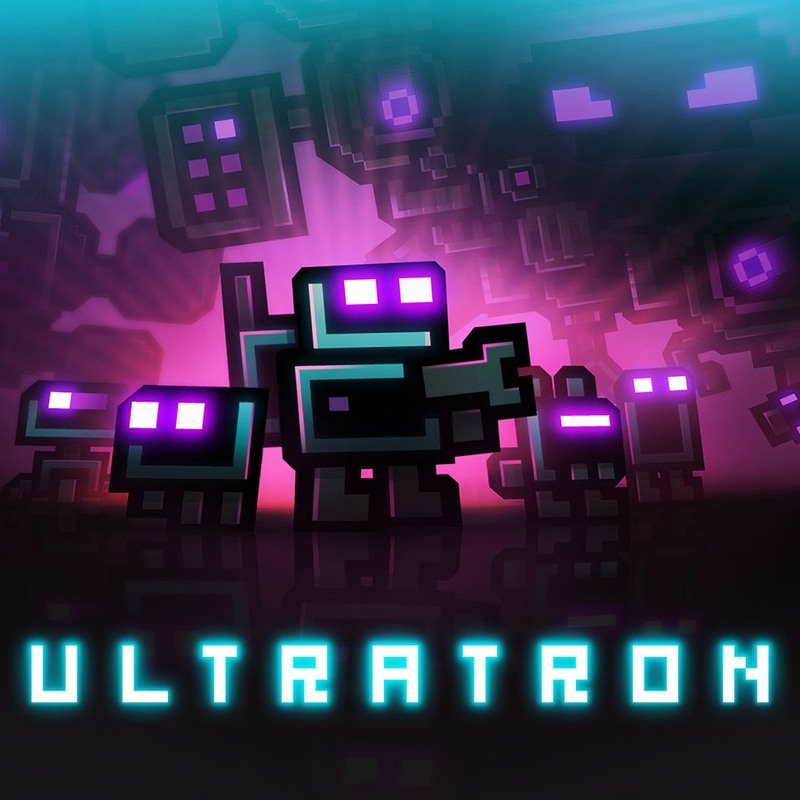 This isn’t a game that seems to tax the Xbox One hard, but at times there are an incredible amount of multi-coloured neon lasers, bullets and other hazards flying across the cool black background of Ultratron‘s single screen arena. Tactical upgrade — Almost certainly my favourite thing about Ultratron is its unique upgrade system, which I’d love to see implemented in future games. 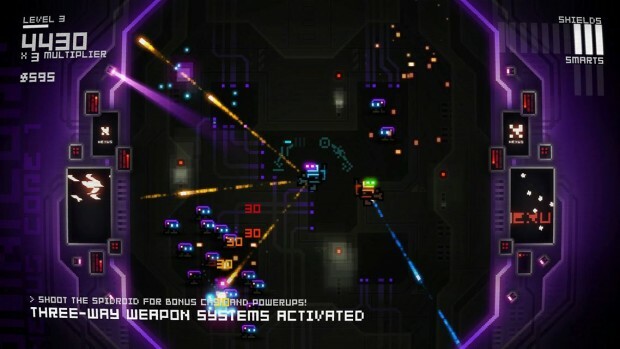 After each of the 40 or so levels in Ultratron, the player is given the opportunity to upgrade their weapons, pets (the in-game name for AI teammates) and other powers and features. 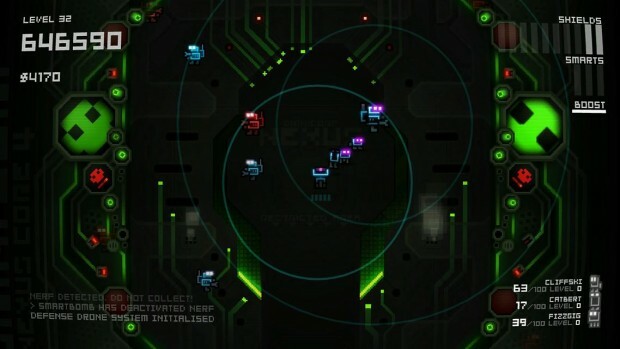 From this screen, players may also replenish shields and smartbombs; both of which are crucial to survival, with shields acting as lives (and not automatically replenishing) and smartbombs clearing the screen when death seems certain. The tactical element comes into play because resources are limited – do you risk investing in a new power which might improve your chances at the cost of having only one shield for the upcoming round? One great feature is that the level of upgrade you’ve achieved remains into the next game, meaning that it can be beneficial to grind levels or to replay past levels to improve your chances of defeating the game’s final boss. Seen it all before — Although Ultratron features a healthy level count, it would be quite the exaggeration to say that they were all different. Each of the 40 levels is a single screen arena with identical features, and every set of ten feature the same basic colour palette. 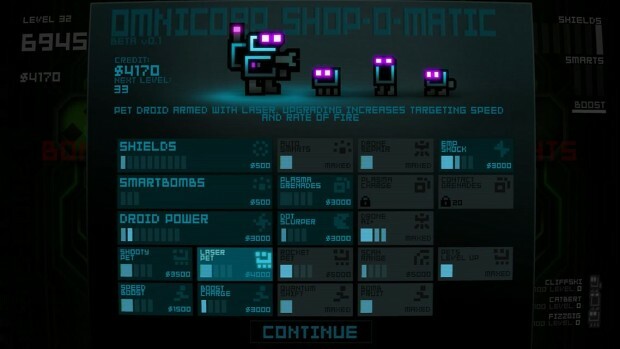 There are also relatively few enemies in the game and the same basic cuboid droids and their more humanoid peers appear time after time, albeit with occasional new weapons or abilities. The whole game is over so quickly that you probably won’t find this too much of an issue, but it does mean that Ultratron stacks up a bit light when compared to much older peers such as Smash TV. Could be worse – Again, this isn’t a major gripe, but if I’m being honest I didn’t find Ultratron to be at all challenging. I managed to complete my first play through within the first 30 minutes of booting the game up, but it was enjoyable enough (and the upgrade system particularly compelling) that I jumped straight in for a second run. In particular, the bosses are unusually easy for a game of this type, whilst the real challenge for me came in the form of the games ‘Assault Stages.’ These throw numerous attack droids at the player rather than the usual waves of passive cubes. I really enjoyed my short time with Ultratron. I think it’s a game that almost anyone could enjoy for a quick solo or co-operative blast of old school, twin-stick fun. It may be a short game, but it has an unexpected layer of tactical depth and a ton of replay potential. It’s also very reasonably priced at 0nly $9.99.